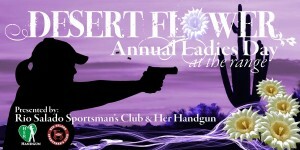 Help us spread the word about Rio Salado’s 2nd Annual Desert Flower Ladies’ Day at the range! Registration for our all-volunteer, not-for-profit event opens tomorrow February 12th at noon! Go to the DFLD Web Page to register. Cannot wait – this will be fun!